Talikwas...how can I describe thee? 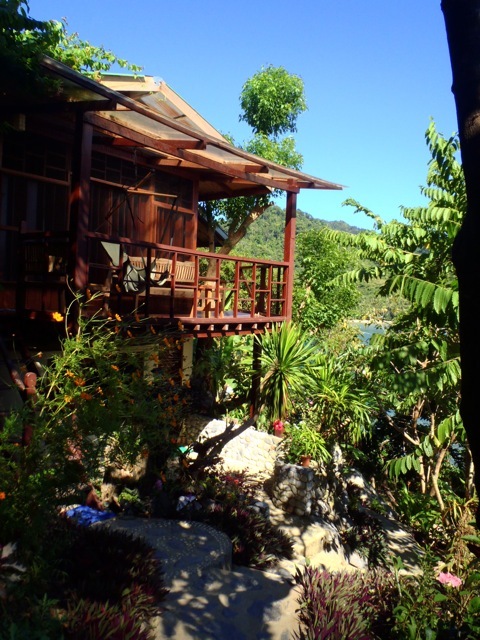 Recently, we had the privilege of having a very wise monk come stay with us at Talikwas. 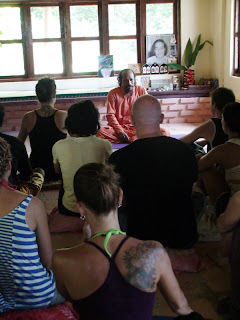 He gave a discourse on yoga philosophy as well as led us in yoga asanas. He is part of the Ananda Marga organization and has been a monk and devotee for thirty years, he is also the personal meditation teacher for Tiger Woods. The monk who is called Dada Atma, describes Talikwas as "a very tantric place." I asked him to describe what he meant. He said that this spot called Talikwas is a very energetic place and a wonderful place to meditate. There is much abundance and magic here. 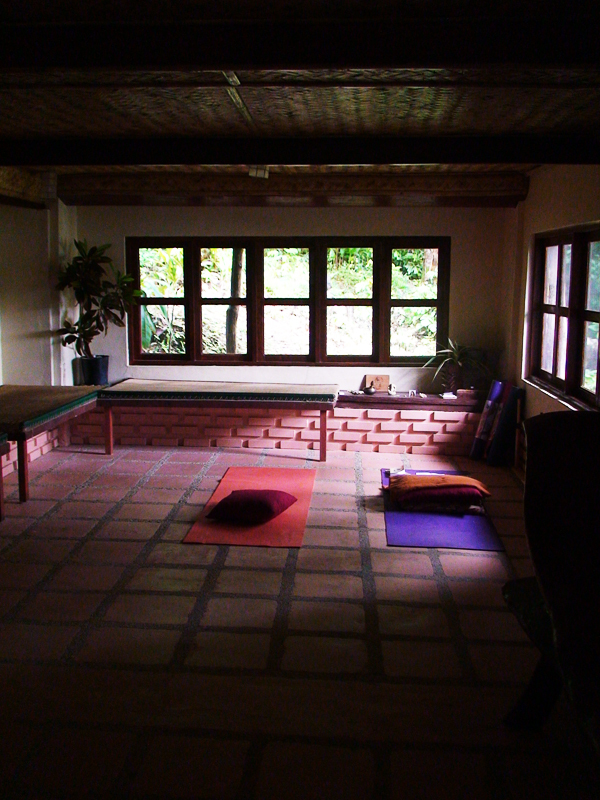 Talikwas - is a tagalog (Philippine) word for unfolding from within - and is a home for healing, yoga, relaxation and rejuvenation. Lucia "Ciay" Misa created this spot, nestled in a marine reserve in April of 2004 and named it Talikwas. 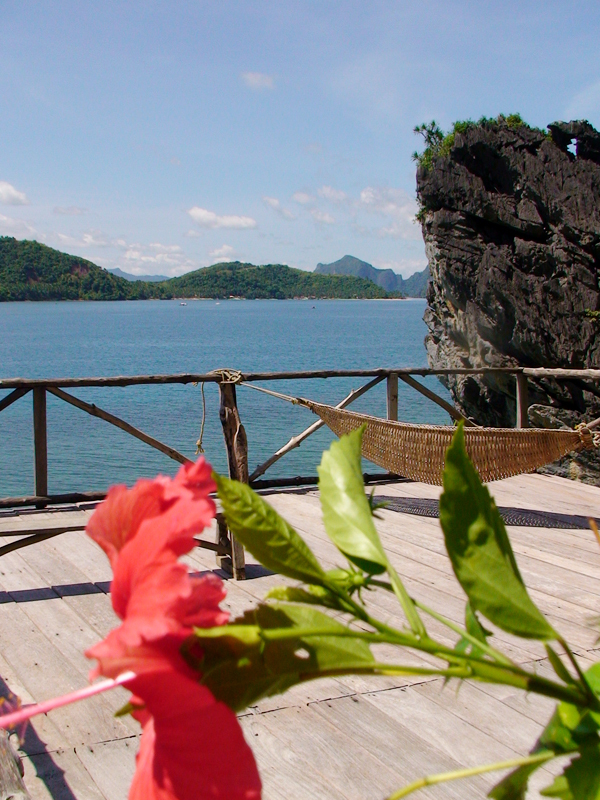 Ciay had the dream of hosting an island haven for artists who are in constant need of inspiration and rejuvenation. 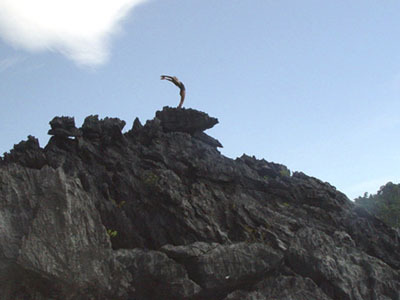 The epitome of yoga is self discovery, unfolding of our true God essence, from the inside out. Talikwas is a place where we can take time to slow life down, enjoy nature and go inward, exploring our spirituality. 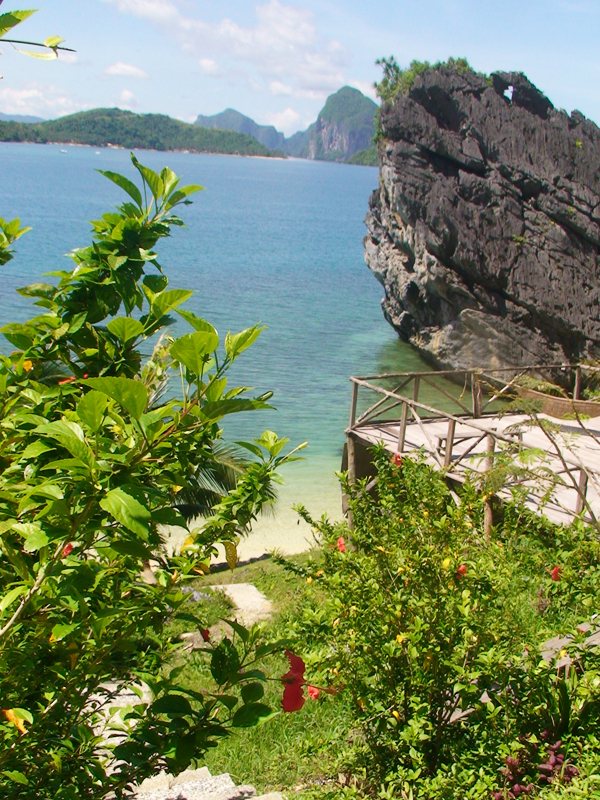 The simple but beautiful retreat is located in El Nido on the island of Palawan, Philippines. 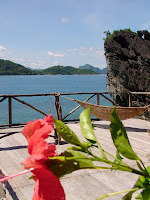 Surrounded by nature, Talikwas is located on stunning limestone cliffs that merge sky, ocean and earth. The goddess lives here. Since coming to Talikwas over a month ago, I have experienced a deep healing within my self and an awakening of my inner power and creativity. Every evening from my balcony, I look up to the starry sky and I thank God that I am able to serve here. I feel very blessed. 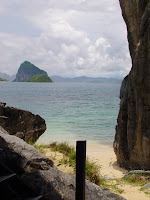 My partner Johan and I came here to Palawan with the intention of sharing yoga, meditation, healing foods and also integrating those things into a natural setting. We believe that we don't have to do much besides let God and mother nature flow through us, she always guides us where we need to be. 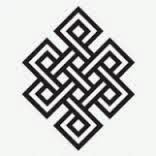 Life becomes a lot simpler in this way when we can surrender to her flow. 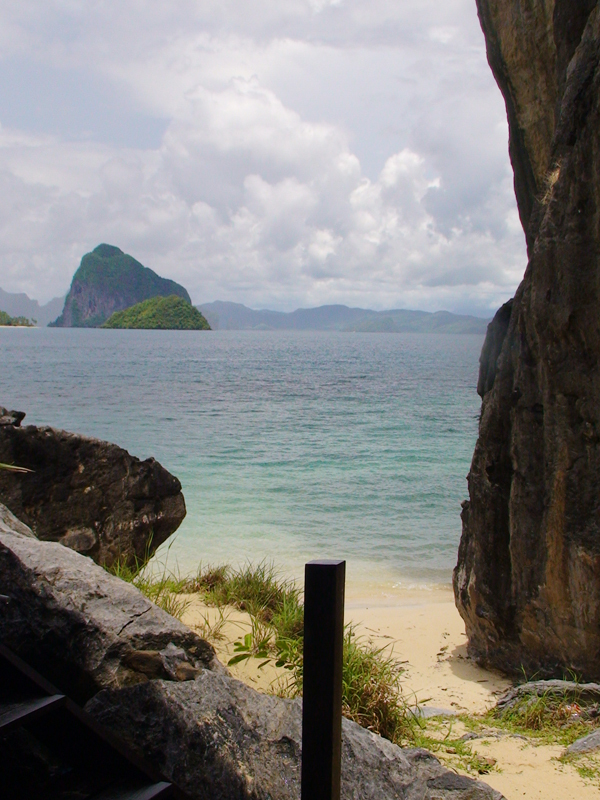 Since I arrived in the Philippines so much new found energy has come through me. I feel the spirit of this land is a beautiful earth mother, flowing and moving through all. Recently, I was introduced to a Philippine shaman or baylan as they are called here. His name is Pi Villaraza and he has started a community and healing center called Bahay Kalipay - house of happiness, along with his beautiful partner and raw food chef, Daniw Arazola. I experienced a deep healing from Pi's healing process called the "Inner Dance" which he discovered spontaneously while living on nothin but cocconuts for 2 years on a deserted island in the Philippines. My body, mind and spirit experienced a freedom and an expression I never knew was possible and this all happened over 3 days at his retreat center, located only 5 hours South of here. I never expected to find this place when I arrived here but I'm glad that I did and I know spirit called me here for a reason. After this healing many things started to shift and open in my life, parts of me I never knew existed began to break free. I started to paint, to dance spontaneously and the joy of life awakened from deep within me. My desire to live closer to nature grew stronger and like a flame being fanned, my heart exploded with the desire to heal and share healing with others. Once you find it, you want it for everybody. Since meeting Pi, Johan (my partner) and I have become more and more involved in the community and fully support them in their mission. Our intention now is to share the healing of Bahai Kalipay's detox center which offers Inner Dance, raw food detox as well as the opportunity to meet and connect with various healers and spiritual people. After experiencing Inner Dancer, we would like to invite retreatants to visit Talikwas and enjoy the peace and serenity of the natural surroundings. Talikwas is a wonderful place to enjoy time for meditation, guided yoga classes, nature trips, personal retreat and to eat energizing, live foods. 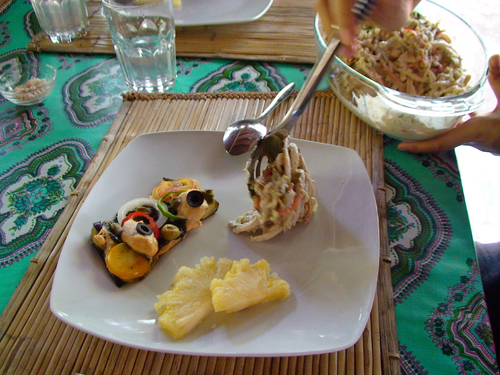 At Bahay Kalipay and Talikwas, raw food is a major part of the detox and healing program. Eating raw allows us to lighten our bodies which also lightens our minds, opening us up to becoming more receptive to spirit and energy. You will find that raw food is is some of the most delicious and satisfying food you will ever eat and the amount of energy you get from it is very tangible. It is always fun to see what kind of raw creations we can create and how much tastier they are than there cooked counterpart. My favorites which I picked up from Bahay Kalipay are raw lasagna, raw chocolate mint ice cream, and raw pad thai. All meals are natural, vegetarian, dairy free and gluten free and made with love. I love riding on the back of the tricycle (motorcycle) with my flip flops barely hanging onto my feet, zipping across the coastal roads. I love the warm, damp air blowing on my bare shoulders. I love getting up in the morning, twisting my hair into a bun and looking out on the ocean from my balcony. I love to go to town and not worry about how I look. I love eating banana after banana after banana without feeling guilty. I love how soft my skin feels from the moist air and I love lathering fresh aloe vera on it after a golden day in the sun. I love Saturday mornings at the market, picking out the many cocconuts, papaya, pineapple, avacado, jackfruit and never having to worry about the price because it is so inexpensive here. I love tasting fruits new fruits, like jackfruit which tastes like bubble gum and guyabano which tastes like avacado, pear pudding. I love this morning how I woke up and picked two beautiful papaya right from the tree. I love never having to wear shoes or socks. I like that nature has just become a normal part of my life and when I am away from it, I notice. 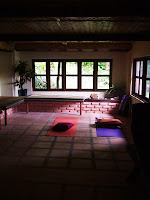 Please feel free to contact us for further details on personal retreats or up coming group retreats. To learn more about Lucia "Ciay" Misa and "soft-belly yoga"
"The best form in which to worship God is every form." Clarity West was born in Vancouver, Canada, the eldest of 4 children and a practitioner of Yoga and meditation spanning over ten years. She began to write stories at the age of 12 and developed a passion for truth telling ever since. "I like to tell it like it is and share from the unique perspective of my generation the "Y" ers. The unique perspective I have comes from a generation raised on yoga culture. Yoga to me is not simply postures or stretching, it is life." With so much going on in the world, the truth must be brought forth. I believe this is my mission and I have known this from a young age. I love to create, I love imagination and I love sharing. As I travel, I document my observations through writing, art and film. I grew up living in the West but relating to the East. I am a modern day yogini attempting to merge the best of East and West following in the footsteps of the great master, Paramahansa Yogananda, my guru. My passions are sharing God through meditation, art, and community. Clarity West Art. Simple theme. Theme images by tolgakolcak. Powered by Blogger.